Duck Dynasty Fan Club? Count Me Out. Dilemma: Is it fair for me to jump into the Phil Robertson fray when I’ve never even watched an entire episode of Duck Dynasty? More than that, do I dare admit that I’ve never watched an entire episode Duck Dynasty? One of my many New Year’s resolutions for 2014 was to try to become less of a cultural know-nothing when it comes to television. I’d give Downton Abbey and Breaking Bad and, yes, Duck Dynasty at least a perfunctory look. Before I could begin this journey of enlightenment, Gentleman’s Quarterly magazine published an interview with Duck Dynasty patriarch Phil Robertson. You know the rest of the story. Some folks took offense at what Phil said. A&E Network reacted by placing him on indefinite hiatus from the show on which he is, by most accounts, the biggest drawing card. Cracker Barrel responded to Phil’s remarks by pulling Duck Dynasty merchandise from the shelves in its gift stores. Almost immediately, millions of fans rallied to support Phil. Some saw his firing as a free speech issue. Others claimed that, because Phil is very upfront about his faith, it was an attack on Christianity. Many labeled it political correctness gone amuck. When it became apparent that no self-respecting newspaper columnist in the USA was going to be able to ignore the brouhaha, I decided to jump in. I started my research by reading the GQ article in its entirety. Then I read a whole lot of other stuff about Duck Dynasty on the internet. I watched several short video clips on You Tube. And I even managed to find a couple of complete episodes of the show on the A&E website. Only then did I form an opinion. Which, naturally, I’m happy to share. I found Phil Robertson’s interview with GQ vulgar and offensive. Though definitions of “racist” and “anti-gay” vary, I believe those terms definitely apply to some of the things Phil said. Which is not to imply he didn’t have the right to say them. It’s a free country. Phil can say whatever he wants. And his employers can fire him if they want. Consumers are free to boycott A&E and Cracker Barrel and any other businesses they choose. The boycotted businesses then have to decide whom they can or can’t afford to offend and act accordingly. That’s how the free market works. Cracker Barrel wasted no time figuring out which side their biscuits are buttered on and quickly put Duck Dynasty merchandise back on the shelves. It took A&E only a few days to reinstate Phil to the cast. Here’s what has me flummoxed. 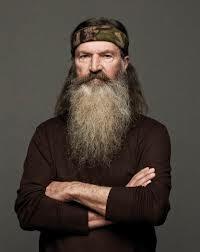 I just can’t figure out why we should care what Phil Robertson thinks or says. How come Duck Dynasty is news at all? Why would anyone want to wear a t-shirt or drink from a coffee mug with Uncle Si’s picture on it? What makes millions of people tune in every week to watch a bunch of long-bearded, camo-clad men go hunting and fishing and then talk about it? Or watch Miss Kay fry up some squirrel or fix chicken-and-dumplins? Or hang out with the daughters-in-law while they sip champagne and get pedicures? Heck, I can see and hear those kinds of things pretty much every day without even turning on the TV. Which makes me seriously question my New Year’s resolution to watch more television in 2014. Maybe being a cultural know-nothing isn’t such a bad thing after all.